LOS ANGELES (AP) — In a summertime battle of sequels, a pair of kooky cops beat out flying dragons for the top spot at the North American box office, but the dragons soared internationally. The R-rated comedy "22 Jump Street" debuted in first place domestically with $60 million, followed by "How to Train Your Dragon 2" which opened with $50 million in ticket sales, according to studio estimates Sunday. Internationally, though, "Dragon" dwarfed "Jump Street" with $24.8 million to $6.9 million respectively. Still, it's an impressive showing for two sequels. The original versions of "Dragon" and "Jump Street" were springtime releases, and their strong performances then led studios to offer sequels during the hot movie-going months of summer. "When a studio has ultimate confidence in something, they will put it in that gladiator arena that is the summer season," said Paul Dergarabedian, senior analyst for box-office tracker Rentrak. "A sequel in the summer is like graduating." It's rare for two films to open with such big numbers on the same weekend, too, he said. Dergarabedian notes it has happened three times before: last year when "Monsters University" opened against "World War Z"; in 2012 when "Madagascar 3" opened against "Prometheus"; and in 2008 when "WALL-E" opened against "Wanted." 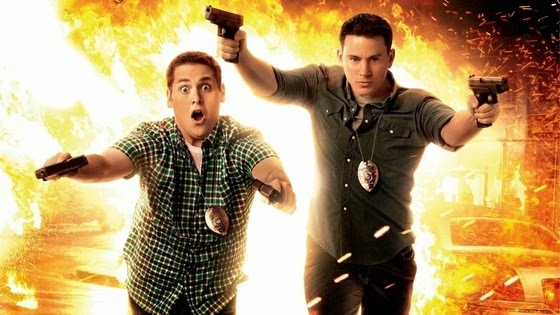 Sony's "Jump Street" stars Channing Tatum and Jonah Hill as bumbling undercover officers who pose as college students to bust a campus drug dealer. Hill also lends a voice to the animated "Dragon," the Fox feature that follows Hiccup and his winged dragon Toothless on an adventure where they discover hundreds of wild dragons and a mysterious dragon master. "To have two movies that opened to 50-plus, that's really good," said Chris Aronson, head of distribution for Fox, which boasts three films in the top 10. "To have a PG-rated, animated film open against a hard R comedy, you gotta love that." Disney's "Maleficent" claimed third place in its third week of release. Warner Bros.' Tom Cruise action romp "Edge of Tomorrow" took the fourth spot, followed by last week's top film, Fox's teen tear-jerker "The Fault in Our Stars." 1. "22 Jump Street," $60 million ($6.9 million international). 2. "How to Train Your Dragon 2," $50 million ($24.8 million international). 3. "Maleficent," $19 million ($37.2 million international). 4. "Edge of Tomorrow," $16.2 million ($37.4 million international). 5. "The Fault in Our Stars," $15.7 million ($16.4 million international). 6. "X-Men: Days of Future Past," $9.5 million ($18.2 million international). 7. "Godzilla," $3.2 million ($38 million international). 8. "A Million Ways to Die in the West," $3.1 million ($4.2 million international). 9. "Neighbors," $2.5 million ($2 million international). 10. "Chef," $2.3 million ($150,000 international). 2. "Edge of Tomorrow," $37.4 million. 4. "How to Train Your Dragon 2," $24.8 million. 5. "X-Men: Days of Future Past," $18.2 million. 6. "The Fault in Our Stars," $16.4 million. 7. "22 Jump Street," $6.9 million. 8. "A Million Ways to Die in the West," $4.2 million.